I attended my first Hi Fi show in 1981, when I was 15. I remember having a grand time, but even now, over 20 years later, I still fondly remember 2 products on display. The first was the NAD 3020 integrated amplifier, which retailed for the crazy cheap price of $199. This little 20 watter sounded far more powerful and musical than its plain wrapper and low price suggested. The other product that really impressed me was on the complete opposite end of the economic scale. The Infinity Reference Standard speakers made the most musical, lifelike sound I had ever heard, and they, in my mind, still have yet to be bettered. At the time, the 4 column 7.5 foot tall system retailed for $20,000. Now, they cost $75,000. Rumor has it that Fabio, the Italian superstar, owns 2 sets. Sometimes, life really isn't fair. Why do I bring this up, you ask? Because while I have owned, sold, and auditioned more pieces of gear than I can remember, relatively few have made a lasting impression. Sure, there are more than these two components, but even after all these years, I could be happy with either of the two, in the right system. I own better gear than the NAD, so I really have no use for it. My chances of owning the Infinity Reference Standards are somewhere between "slim" and "none," and "slim" just left town. If only there was a relatively reasonably priced speaker that made an impression on me like the big Infinities. I've been searching for years, and nothing has come close, until now. The Bulldog is manufactured by Cliffhanger Audio of Ontario, Canada. Cliffhanger Audio manufactures a complete line of high fidelity speakers priced as low as $400 per pair. All Cliffhanger Audio loudspeakers are covered by a 5 year warranty. The Bulldog is a 3 way speaker, with a 6" woofer, 3" metal dome midrange, and a ribbon tweeter. It measures 19" high, 8" wide, and 16" deep and is built like a vault. Each speaker weighs in at a formidable 60 pounds, and requires very sturdy stands. Underneath the high quality veneer finish, the cabinet is made of 3/4 inch medium density fiberboard. More important than that, however is what is underneath the MDF: steel plates reinforced with steel braces. Due to the tightly populated baffle, there is no provision for speaker grilles; the midrange is protected by a perforated cover, the ribbon tweeter projects through a tall, narrow opening on the front of the unit. The front and rear of the cabinet is finished in black lacquer. Around back are two small ports, side by side at the top of the cabinet. In the middle are a pair of gold plated binding posts. No provision is made for bi-wiring. The Bulldogs are available in a variety of finishes; the review pair was finished in a very attractive light maple. Recommended amplifier power is 50-300 watts. I've heard about these speakers for nearly three years. 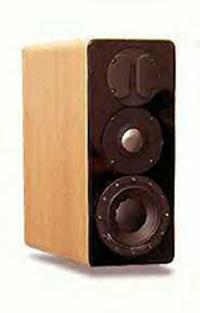 Michael Allen of JoLida gushed about these speakers when I did the reviews of the JD-302 and 502 amplifiers. Not long after I finished my review of the JD-100A CD player, my phone rang. Michael had arranged for a review pair to be sent to me if I was interested. While I admit I was intrigued, I really didn't expect that they would be to my liking, as I tend to like a very rhythmic, yet somewhat relaxed presentation, he prefers a sound that is even more laid back. Additionally, I wasn't too keen on the idea of stand mounted monitors in my listening room after my experience with the Newtronics Gate. But, I was willing to give them a shot. Within a couple of weeks, I had them set up in my listening room. With an efficiency of 86 dB measured with a 1 watt (2.83 Volts) input at 1 meter into their 6 ohm load, the Bulldogs require lots of quality power to sound to sound their best. My McIntosh MC162 puts out 100 watts per channel into 8 ohms, 160 into 4 ohms, and it got a real workout when lashed to the Bulldogs. Even at low levels, the power level meters danced quite a bit; at high level listening, the amp was driven very close to clipping. Personally, I like to have more power than I need; I really don't like pushing the envelope. I really would have preferred a pair of 162s run as mono blocks (325 WPC into 8 ohms) or possibly a MC352, but I didn't have any spare Mac gear lying around. When Michael called, he warned me that they were rather inefficient, and he doubted I had enough power. He sent a second JD-502 amp, so I could run it as mono block with my personal JD-502. This setup develops 117 watts per channel of tube power, roughly equivalent to 235 watts per channel of solid state power. Along with the JD-502's, I used both my Audio Research SP 9 preamp and a Headroom Max headphone amp, used as a preamp, when the Audio Research developed some age related problems that required its return to the factory for service. It has been returned in tip top condition. I grew up in a "solid state" world. My first "real" system had a tube integrated amp, a Heathkit AA-32 circa 1962, but this was in 1977; the amp had been abused and had seen better days. I loved the sound of it, but it proved to be unreliable. It was constantly in need of service, and if there is one thing that will make me grumpy, it's living without my music. Keep in mind, I was 11, and then, as now, the "repair guy" doesn't work for free. So, I saved my pennies and bought a new Pioneer receiver. I used it for a few years before I upgraded. My older brother used until just a few years ago, when it finally died. While Sam Tellig of Stereophile may have called himself the "Audio Cheapskate," he has nothing on my brother John. For years, I ignored "that tube stuff." With solid state amps, the amp needs to have a "bridge" switch and the speakers are usually connected differently from stereo use. I was unaware how easy it is to bridge a JoLida amp. At the outputs, connect the positive taps (either 8 ohm or 4 ohm depending on the load) together with a bit of insulated speaker cable. Do the same with the grounds. Connect the speaker to either output. Then use a Y cable on the inputs. It's that simple. If the amps are being used as power amps, as I did, just select the proper input, adjust the gain settings equally, and control the volume with the preamp. It may be possible to bridge other tube amps in a similar manner, but I am totally unsure and recommend you contact the manufacturer for advice. I had a very difficult time getting a handle on the sonic signature of these speakers. I've come to the conclusion that they simply do not have one. I know this makes no sense, but stick with me here. Think of any audio brand out there. They all have sonic signatures. Some are bass heavy, some bright, or midrange forward. Some are balanced, but ultimately bland. Some are flat out bad. Others are excellent. But they all have a "sound" and they all impart this sound to all of the music, all of the time. With the Bulldogs, sometimes I thought "well, they're a bit bright, or a bit forward there in the midrange, or a bit lean in the bass." So, what's the catch? They all do this on different recordings. In fact, every recording was a surprise, and I mean every one. None sounded exactly the way I expected them to sound. For the vast majority it was a pleasant surprise. With any other speaker I have heard, the speaker is colored to the taste of the designer. With the Bulldogs, the sound is colored to the sonic taste of the producer. I am aware that I am on thin ice here; if you doubt me (I'm sure you do) all I can say is "Go listen to them." I listened to all different types of music with the Bulldogs, and found myself veering wildly away from my audition list. When the Bulldogs arrived, they found me in the middle of a classic rock jag. I was all over the place. The Beatles, The Who, Focus, Moby Grape, Ian Dury and the Blockheads, The Clash, and many many more groups have found their way onto my system via the Bulldogs. My first example comes from Focus, the Dutch progressive rock band. In 1974 they hit number nine on the US singles charts with "Hocus Pocus". (Greatest Hits EMI/Fame FA41 31121) If you've not heard it, it is quite interesting. The song features, of all things, yodeling as the "hook", or the part that makes a catchy tune. The middle eight features accordion driven polka. The appeal to me is the searing lead guitar of Jan Akkerman, who was once rated as the best rock guitarist in the world. Just one listen will prove that the accolades are not unfounded. And while the pyrotechnics of Akkerman's playing didn't disappoint in the least, I was suddenly aware of the bass work of Martin Dresden, which not only propels the rhythm of the track, but keeps the group grounded as well. All this from a stand mounted speaker with a 6 inch woofer. I was stunned. My second example will likely upset a large number of vinyl fans. Generally, there are two camps when it comes to Mobile Fidelity Sound Lab's Half Speed Mastered LPs. The first camp contends that MoFi recordings are the closest thing to the master tape available. The second camp claims that the recordings are unnaturally boosted in the bass and treble. I have been in the first camp, until now. One morning, before I had to head off to work, I pulled out my MoFi copy of "Misfits" by the Kinks. (MFSL 1-070) It's a fantastic album, but I found myself doing a double take: I could nearly see the "smiley face" on a graphic equalizer. There was a definite boost in the bass and treble. It was obvious. My standard CD copy sounded much more natural. Usually, when listening to a system, as the volume is increased, the sound gets louder. And so it is with the Bulldogs. But, with the Bulldogs, something special happens. On really good recordings such as "Live at Blues Alley," the sound not only gets louder, but they also create the illusion of stepping closer to the stage. Its not that the sonic image is being projected more towards the listener, it sounds as if the sonic image is stationary, and the listener is moved towards it. To me, this shows excellent design and construction practices on the part of Ian Smith, designer and President of Cliffhanger Audio. At low levels, I could hear everything clearly. At high levels, I gave up before the amps or speakers did. There is not much to report here. The speakers are inefficient, and will not perform well without a healthy amount of quality power. Due to their weight and depth, they require very high quality stands. While I am a reviewer, I do not pretend to know everything. The Bulldogs have really cut me down to size; they have proven that I do not know anything. Small diameter woofers can't do true high quality deep bass. Stand mounted speakers don't work well in a big room. Metal dome midrange drivers are harsh. Ribbon tweeters don't have good dispersion; they create a very small sweet spot. These are all ideas that I have had that have usually been proven right through my experiences. I have heard some speakers that break a rule; the Bulldogs broke all of the rules. With my Infinity Kappa 6.1s back in the system, I heard a loss of focus, as if I was looking at a picture through foggy glass. The bass wasn't as tight, or as deep. And while I wouldn't call the upper frequencies harsh on the Infinitys, they certainly aren't as realistic as they are on the Bulldogs. The midrange is also slightly forward all of the time with the Infinitys, which I had never before been aware. Remember, with the Bulldogs, it comes down to the recording. Feed them raunchy rock and roll, that's exactly what you get, nothing more, and nothing less. Feed them an angel's voice, and they can bring tears to your eyes. Maybe instead of "Bulldog" they should have been called "Chameleon". If you are looking for a speaker in this price range, or even above, I wholeheartedly recommend an audition of the Bulldogs, assuming that you have enough quality power to run them properly. If they are fed too little power, the full potential of these speakers will not be realized. And here's a warning: if you are in the market for new speakers and cannot afford them, don't listen to them; they very well may spoil your enjoyment of what you can afford. Here is the part where I tell you I bought the review samples, right? Not exactly. While I do plan on purchasing the Bulldogs, there are some issues to work through. There is the matter of amplification, whether to buy another identical McIntosh amp and bridge them or to buy a different amp altogether. Additionally, the transmission on my wife's BMW decided to take a permanent vacation, so the Bulldogs will have to wait a bit. But sometime soon I will be buying a pair. I can't think of a speaker up to $10,000 that is ultimately easier to live with or more enjoyable. There is one more thing about the Bulldogs that I don't like. They aren't here anymore.